If you read my blog carefully, you’ll have seen that a few weeks ago I did something I hadn’t done before: double-post a recipe. For some reason, I had no memory of posting Gingery Sweet Potato and Apple Saute in March 2015, and didn’t even realize the duplication until a week after posting it again in January. At least, one might argue, they were nearly two years apart. I’ll admit life is busy now – in addition to my full-time (plus overtime) contract position, I’m juggling a few freelance projects. And maybe that’s making me absent-minded. Because when I went to post a recipe today, I hovered over the cauliflower-kale gratin photos on my computer before realizing I’d posted that one six weeks ago. After that near-miss, I triple-checked that I hadn’t already posted my recipe for Garam Masala cookies. And I’m happy to say this is a brand-new recipe for my blog! I’ve made so many cookies in my life that it’s rare to come across one that’s completely different, but this one truly is. I wouldn’t have imagined how great an impact garam masala would have on a batch of cookies. And I promise you this – if you make these cookies, you’ll never forget them. In a stand mixer, beat butter and sugars until creamy. Add egg, orange zest, and orange extract and beat well. In a separate bowl, combine flour, baking soda, salt, and garam masala. Stir the flour mixture into the creamed sugar mixture a little at a time until combined. 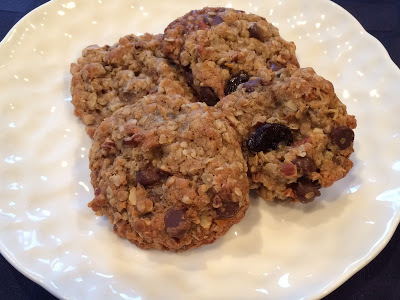 Fold in oats, toasted pecans, chocolate chips and dried cherries, and stir until just mixed. I'm not sorry you posted that recipe twice because it reminded me that I want to try it sometime. Glad you have a lot of contract work. Me too. In fact, I'm taking a break on a Sunday night from work. Sigh. The cookie recipe reminds me of Indian flavors. Yum! LOL…sometimes I have to do a recipe search on my blog to see if I've shared an old favorite or not. I didn't even realize you had reposted the same recipe. I've actually been updating old photos, since it gives me an excuse to some of those recipes again. 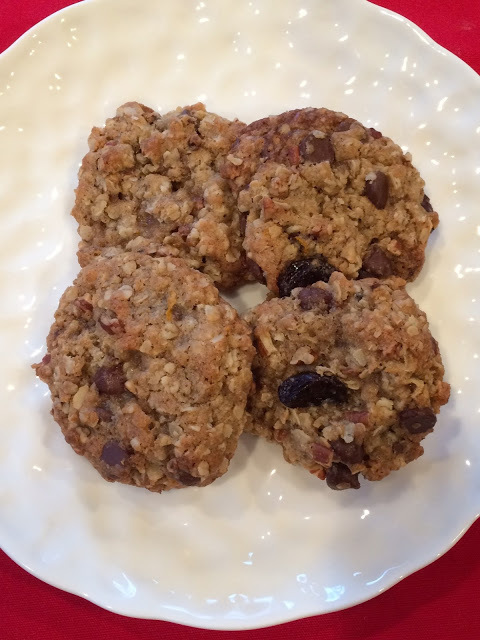 I love oatmeal cookies and these have a fun twist with the garam masala!! That's funny–I had a nearly identical experience recently, except I caught my almost-duplication just in time. Too many years of blogging I guess! What a great use for garam masala! I've never thought of using it in sweet biscuits. I love the add of garam masala in these cookies. Definitely a must try for me. Life happens. So much happening at one time. 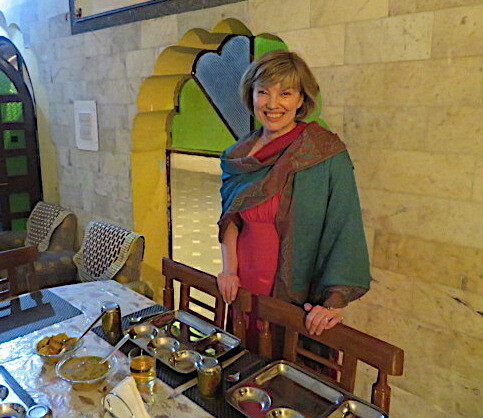 Double posting can be a good thing just in case your readers missed a great recipe. I feel like everyone who's been blogging for a while has done that! Woah! So glad that you shared it twice. Never knew garam masala could be used in cookies. I have never tried these garam masala cookies, so it is a must try recipe for me. All the add ins sound so good and garam masala is so unique for cookies. I rarely make the same recipe twice, so I don't typically have that problem, but I can definitely see how it would happen. Love these unique cookies! And repetition is understandable with your busy schedule! Good luck balancing it all…cookies help! this is a very interesting recipe–i've definitely never seen or used garam masala in a dessert. worth trying, for sure! This is my kind of cookie, looks delicious, Beth! I double-posted way back when and learned I have to double check everything I do now. But actually, it might be a good thing, for those who missed it the first time around. Have a great week! I came really, really close to publishing a duplicate recipe once. Had the post all written and was working on the pictures and thought to myself that the subject seemed oddly familiar. Oops! 🙂 Anyway, great looking cookies. And a cool way to use garam masala. Thanks! It happened to me once as well. I took pictures of a dish and edited them before realizing I had posted the exact same recipe more than one year ago… 🙂 This sounds really interesting, making cookies with garam masala, I would love to try them. I dont remember this but look absolutely delicious Beth!! The more busy I am the more I forget! It goes with the territory! Your cookies are truly original! Beth, I've forgotten I blogged recipes or surprised myself with things I included in old pictures in posts! Always fun to look back and see how the mind works 🙂 These cookies with garam masala look delicious and definitely sound unforgettable!! Well this truly is a different cookie recipe…I never would have thought to add garam masala to cookie dough. Thanks so much for sharing and this is definitely not one you have posted before.